If you’ve ever set foot in a box, there’s a good chance you’ve seen athletes wearing knee sleeves. Maybe you’ve even thought of investing in a pair for yourself. Do you know exactly what purpose they serve, though, and the benefits they provide? Here’s the story on knee sleeves. In a nutshell, knee sleeves protect the knee from injury or risk of damage. With the knees experiencing the continued pressure and stress of regular workouts, the extra support comes in handy. Sleeves are common for functional fitness athletes, Olympic weightlifters, and powerlifters, in particular. Providing valuable compression, knee sleeves increase blood flow and reduce pain. You’ll notice your knees are able to warm up quicker and will stay warm throughout your workout. 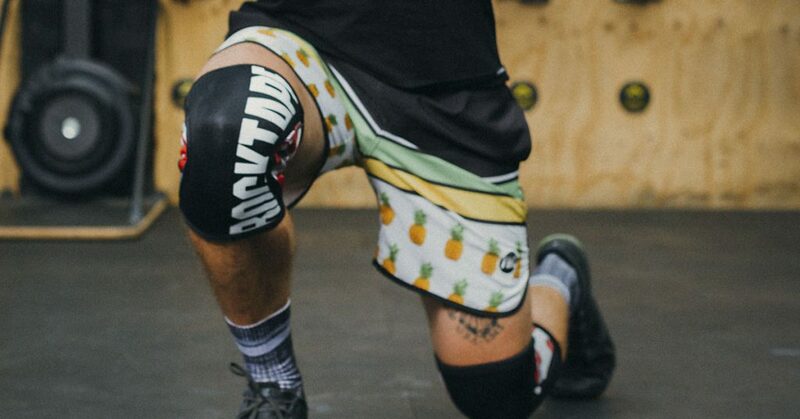 Knee sleeves are beneficial post-WOD too, as they aid in recovery by helping reduce swelling and minimize pain. They’re good for your technique and positioning, as well. Because of the extra compression, they provide significant lateral hold, supporting your patella and joints, stabilizing you as you squat under heavy weights. Important note: knee sleeves are a training aid. 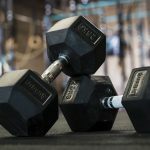 In order to prevent injury, it is crucial you work on mobility, technique, and mastery of movements and lifts together with your coaches. Sleeves are a complement to these things — not a replacement. Fitness takes its toll on your body, and protecting your knees is crucial. They do a lot of work and have many responsibilities, and unhealthy knees could turn into unhealthy ankles, hips, and even back issues. There’s a reason you see so many people wearing them. Which Knee Sleeves are Right for You? A lot of this is based on personal preference, but we love RockTape for functional fitness and Olympic weightlifting. These are neoprene sleeves that provide the perfect balance of compression and warmth. When you slip these on, you instantly feel the difference. They’re tight without being suffocating, largely because their sizing systems are accurate and simple to use. What Thickness Do You Choose? In short, we recommend 5mm for metcons and general workouts, with the 7mm more suitable for heavier powerlifting and Olympic lifting workouts. Here’s the rundown. These are ideal for athletes in endurance sports and training. Due to their weight, they are ideal for carrying light equipment, long-distance training, and the like. These sleeves serve to support an athlete when they’re starting out and at the end of their workout. Additionally, it helps the wearer regain control of their knee movements. The 5mm sleeve is applicable to many activities, like long-distance running and general gym use. This sleeve provides benefits in varied training areas where both agility and support are required by an athlete. If you’re playing with mixed activities, rest assured the 5mm will be your sleeve of choice. This is a sleeve for some of the heavier activities. The benefit of using 7mm sleeves comes in the form of the power stabilization it offers athletes. When you’re lifting heavy, this is what you’ll want to help you achieve that much-needed stability. When you need extra support for when you’re going through rehab, this aids in that as well. Historically, this sleeve is mostly used by weightlifters, because it’s the thickest and most sturdy. If you want to ensure your shorter, heavier activities are performed with more precision and security, the 7mm knee sleeve is the one for the job. Consider your specific activity, the level you’re at, and the kind of assistance you need — these factors will help you find the perfect knee sleeves for your fitness. If you love your knee sleeves as much as we do, be sure to air them out after each training session. The harder you train, the more air they will need. If you are like us and want to train in these every chance you get, it may be worth investing in two pairs. And always remember to wash them! Ready for a fresh pair? 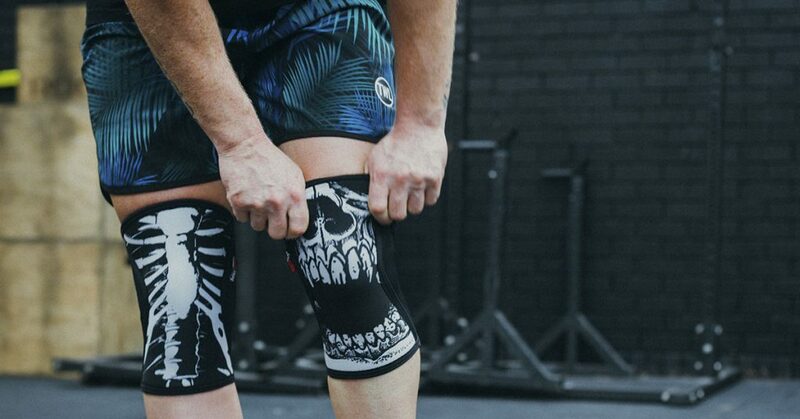 Shop more knee sleeves at The WOD Life! Knee Wraps or Knee Sleeves?